As much as I enjoy food blogging, there is one thing that I decidedly do not love. And that would be the simple fact that when you blow it, there is photo evidence. When I make something new, I take pictures “just in case” it’s good enough to share. Because, you see, I don’t share it with all of you if it’s no good. And I won’t know if it’s no good until it’s all said and done. So the result it lots of pictures of in-process dishes that just don’t make the cut. It wouldn’t bother me at all, except that sometimes I’ll make something that turns out to be incredibly delicious, but, well…. it sure don’t look it. I’ve made a certain chicken dish about eight hundred times, but the pictures always make it look kind of strange and unappetizing, even though it’s delicious. I’m just not a good enough photographer to make some things look good. And to exacerbate that frustration, there are times that things don’t look good not because there is something inherently unattractive about the food, but because I messed up. This recipe, my friends, is one of those. 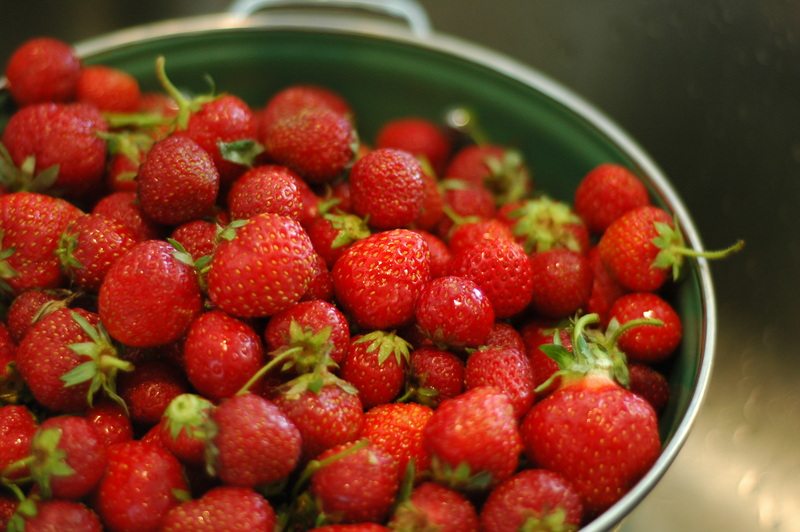 It started because we went strawberry picking last week, and came home with goo-gobs of beautiful, tiny, fragrant strawberries. 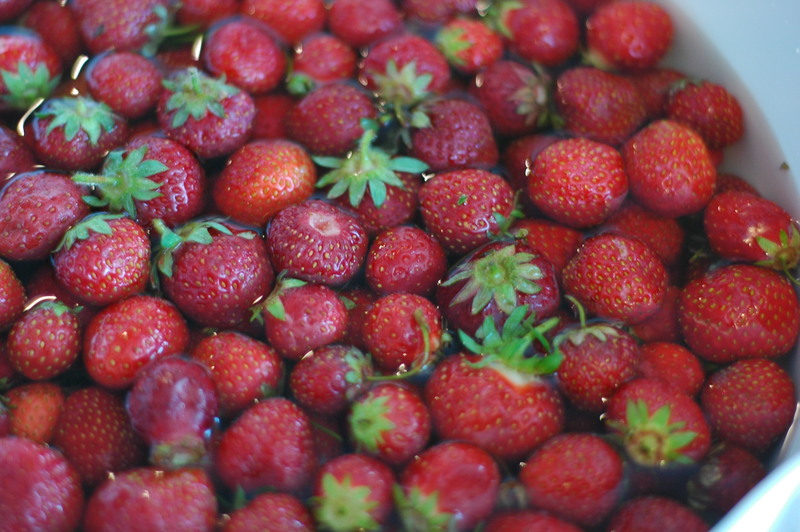 I wanted to make them into something stunning and somehow keep the strawberries themselves as unadulterated as possible. It should have turned out to be breathtakingly beautiful- that’s certainly how I imagined it in the beginning. But it started looking and smelling so good that I got a little impatient and maybe jumped the gun a little on certain steps. Perhaps I didn’t let the rhubarb cool enough before I added it to the cream cheese mixture. Maybe I didn’t let the tart bottom cool before pouring in the filling. And then there’s the chance that I didn’t even let that set long enough to firm up and hold the strawberries’ weight. Ok, so it was all of those things. And at that point, I don’t mind telling you, there was no chance I was going to wait to go for my first slice, since it was such a hot mess anyway. This is where the plot thickens. It was so delicious, that I couldn’t not share. Because I’m sure that some of you would actually have, um… patience. And yours would turn out much lovelier than mine. And the taste is so worth it. 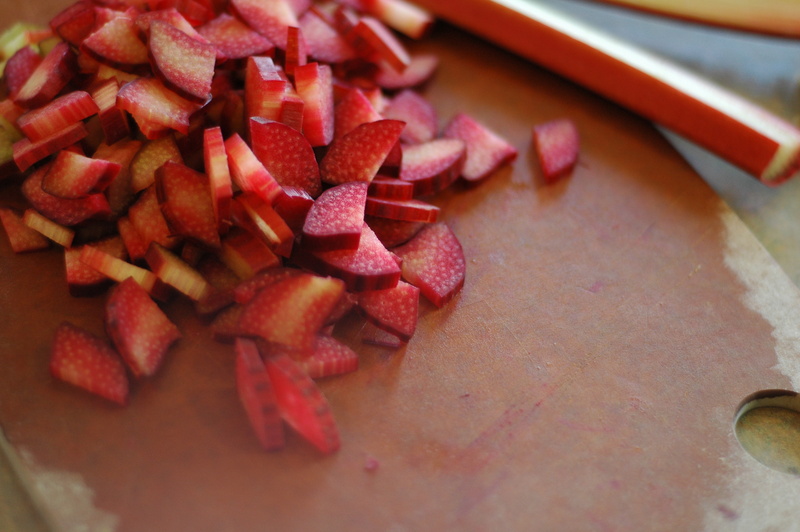 I’ve always loved the tart rhubarb and sweet strawberry combination, especially when both are at their seasonal peak. 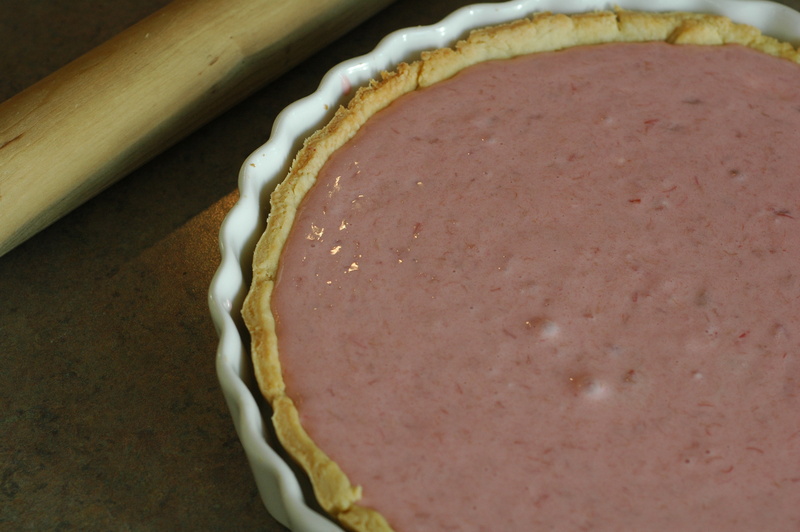 The creamy richness of the filling is the perfect counterpoint to both that I can’t imagine a better way to eat either rhubarb or strawberries. This might be, for me at least, the perfect summer dessert. So, the moral of the story for today is: Do as I say, not as I do. Or do as I do, because even as a hot drippy mess, this was one of the yummiest things I’ve stuffed my face with in a long time. Combine flour, salt, and sugar in a large bowl. Add the cubed butter and rub it into the flour mixture using your fingers until it resembles course meal. In a small bowl, mix the egg yolk, lemon juice, and the water. Add the flour mixture and mix with a wooden spoon. Try to press the dough into a ball. If it is too dry to come together, add more water, one tablespoon at a time until it does. Turn out the dough onto your work surface and work the dough until it is pliable and peels off easily from the table. Do not overwork the dough- just until it starts looking nice and uniform. The the dough into a disk and refrigerate for 30 minutes. After the dough has chilled, roll out the dough until it’s about 1/8 inch thick. Wrap your rolled dough around the rolling pin until it’s all rolled up like a scroll. Then, unroll the dough over your tart pan. (Or use whatever method works best for you to transfer the dough to the pan.) Gently press the dough down into the pan. Don’t worry too much if you have a few cracks- just push them together as best you can. 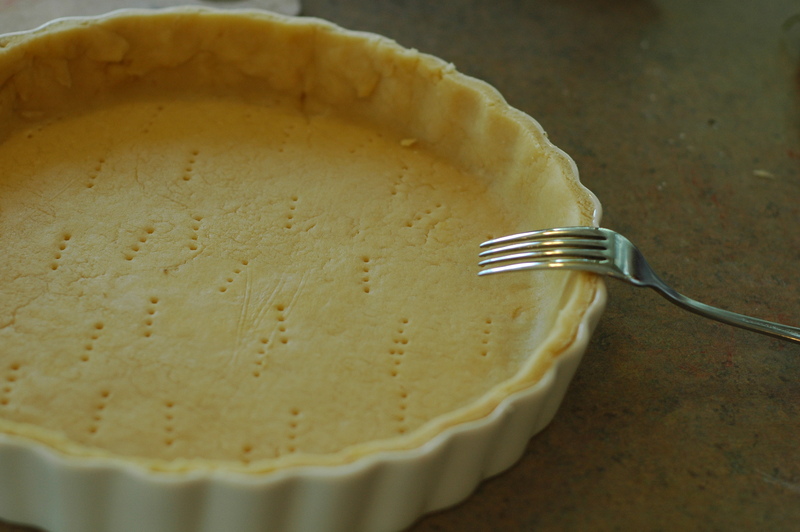 Prick the bottom on the tart pan all over with a fork. Then, line the pastry shell with foil and smooth it over the bottom and sides. Fill with beans or pie weights- enough to cover the bottom. Bake the shell for 15 minutes, until the dough looks slightly dry. Then, remove the beans or pie weights and foil, and continue baking for another 10 minutes, or until golden brown. Let cool completely before adding the filling. 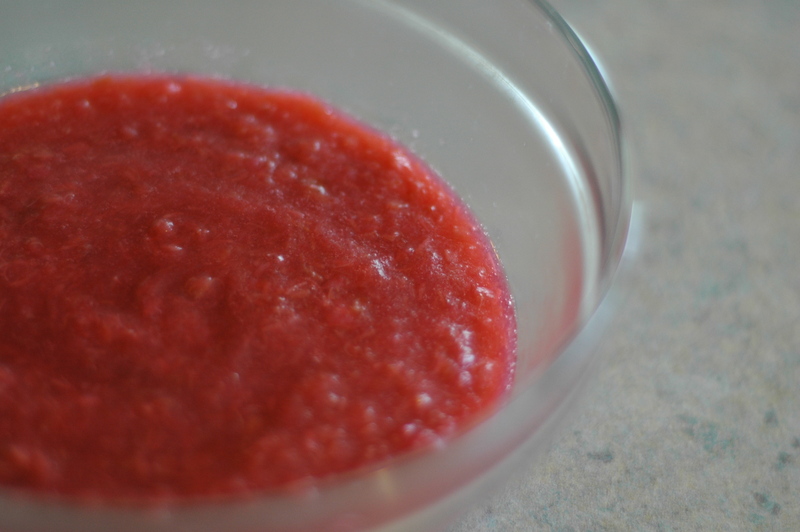 In a small saucepan, combine rhubarb, water, and sugar. Cook on medium-low heat for about 15-20 minutes, or until the rhubarb has completely fallen apart and the sauce is somewhat thick. Take off heat and cool completely. In a stand mixer with the paddle attachment, beat the cream cheese and confectioners’ sugar until creamy and fluffy. Chill in refrigerator for at least an hour. 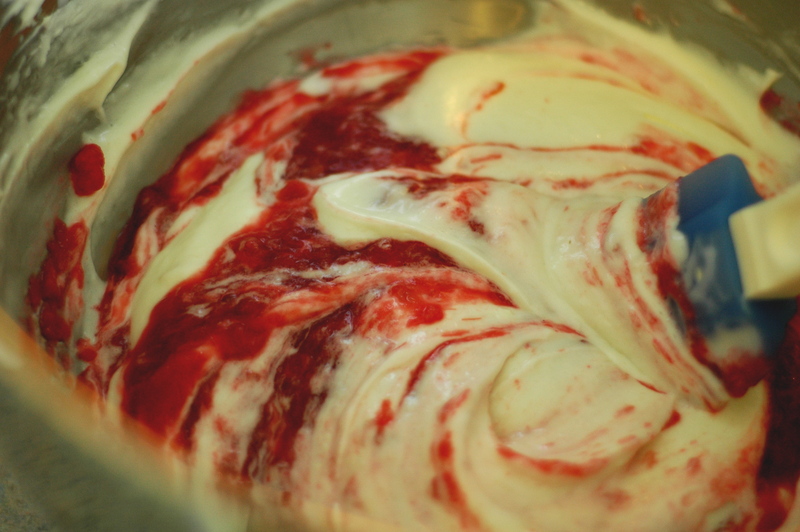 Remove cream cheese mixture from refrigerator and fold in rhubarb mixture until completely incorporated. Smooth filling into cooled tart shell and chill for another hour. 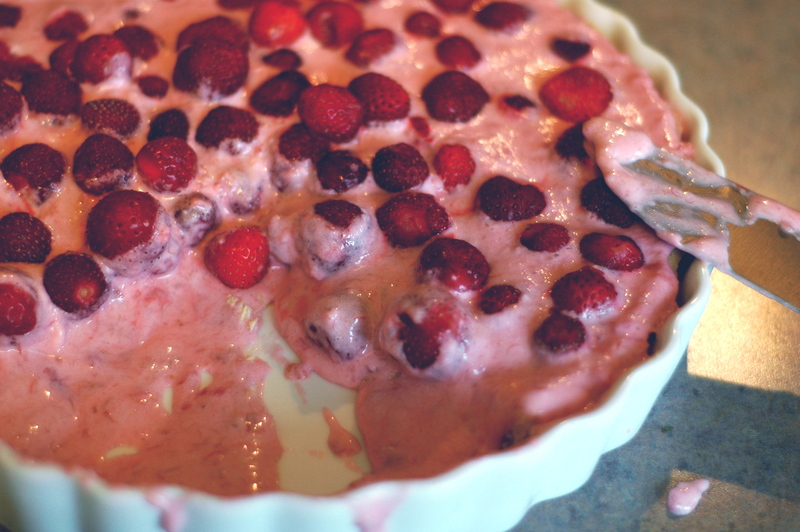 Once the tart is chilled, top with strawberries. 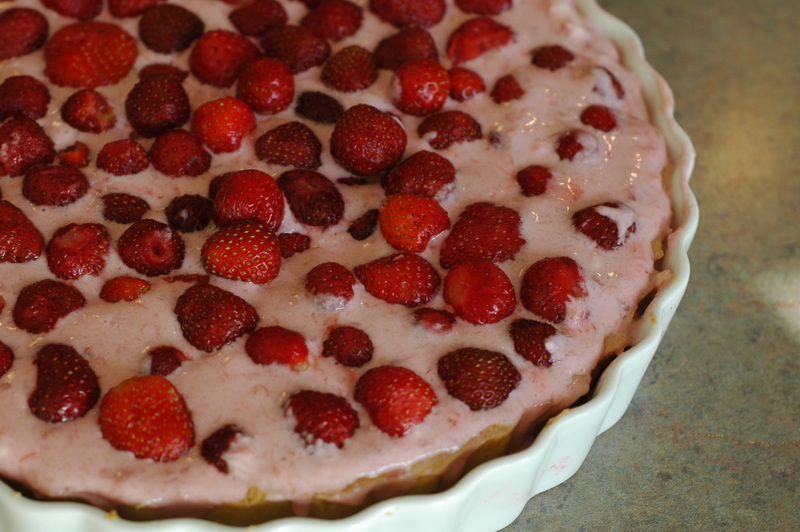 You can glaze the whole tart with some glaze or warmed jam, if you like, but I prefer to leave the strawberries plain when they are fresh and in season. OMG this looks amazing..I will make it and have my way with it soon!